Minocqua Chain home on Lake Kawaguesaga, now available! 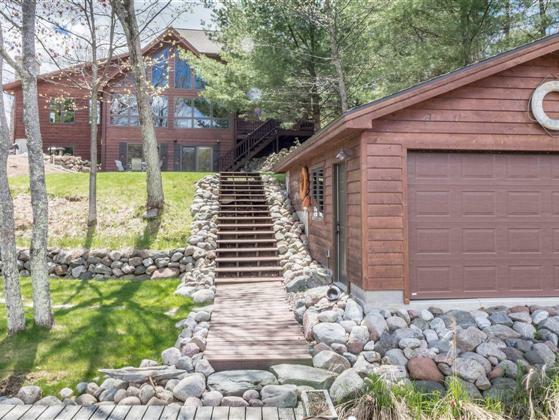 The sought-after cedar sided chalet with the Northwoods appeal you have been looking for. Superb location, only minutes from downtown Minocqua, but near the end of the road & 1/8th mile from the Bearskin State Trail (biking, hiking, snowmobiling). Curb appeal from both the road and the lake. Very gradual slope down to the shoreline and the 18'x28' dry boathouse (2003). Original home was built in 1997; however extensive remodeling and an addition in 2015; make this practically a brand new home. Quality throughout, amplified by the fieldstone fireplace, updated kitchen, walk-in tile shower & walk-out lower level. Some of the other recent updates include: Roof (2011), furnace (2012), master bedroom suite (2011), garage (2011), septic system (2015). Add'l exterior attributes include: Professionally landscaped with trickling pond, irrigation system w/ lake pump, lakeside firepit, blacktopped driveway. You simply turn the key & enjoy!